T’ruah: The Rabbinic Call for Human Rights brings a rabbinic voice and the power of the Jewish community to protect and advance human rights in North America, Israel, and the occupied Palestinian territories. Through targeted human rights campaigns, T’ruah trains and mobilizes its network of 1,800 rabbis and cantors, together with their communities, to bring Jewish values to life through strategic and meaningful action. T’ruah brings together rabbis and cantors from all streams of Judaism, as well as members of the Jewish community, to act on the Jewish imperative to respect the human rights of all people. 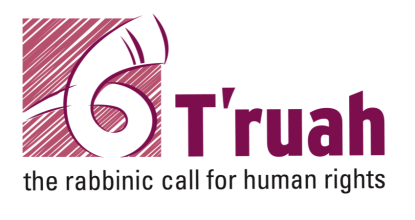 Grounded in Torah and Jewish historical experience and guided by the Universal Declaration of Human Rights, T’ruah calls upon Jews to assert Jewish values by raising their voices on the most pressing human rights concerns of our time. Join FMEP in supporting the work of T’ruah by making a charitable contribution today.